Protasparagus densiflorus , (Kunth) Oberm. 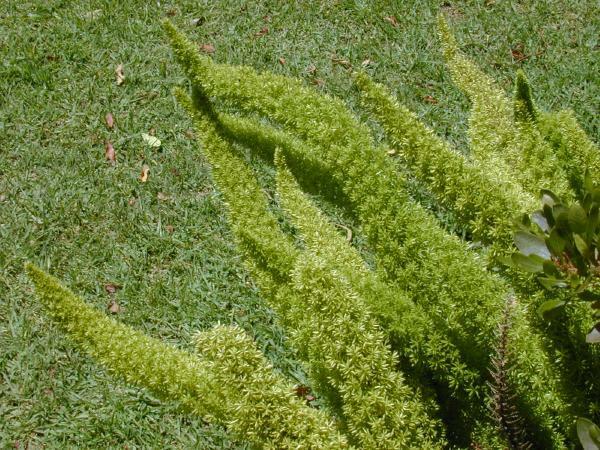 Asparagus densiflorus, commonly known as asparagus fern, is not a true fern. It reproduces by seed. A. densiflorus is known to invade a variety of habitats, and its impacts include smothering of forest understory and ground cover and preventing the regeneration of canopy species. Asparagus densiflorus is described as a spreading perennial herb with a fine texture and stiff, upright habit. The stems which are stiff and erect and a bit woody are armed with stiff spines, they emerge directly from the ground. The plant grows rapidly up to a height of 60cms. The leaves of the plant are small and scale like, what we consider to be leaves are actually narrow, light green, leaf-like branchlets called cladophylls which can reach lengths of 2.5cms. The needles are clustered at branch nodes. The flowers are small, white or pinkish white, and fragrant; the fruit which are quite showy are bright red in colour about 8mm in diameter, and are typically 3 seeds per fruit (The University of Florida, 2002; Gilman, 1999). Eating Asparagus densiflorus berries may cause gastrointestinal problems. Skin irritation with redness, swelling, and blisters following contact with sap. He et al. (2001) observed that A. densiflorus is resistant to the fungi Fusarium oxysporum, F. asparagi and F. proliferatum. The authors believe this resistance is centered around the production two defense enzymes that A. densiflorus can produce. Seeds may germinate at any time of the year providing moisture is available, but there is a major flush in spring and a smaller one in autumn. Growth rate is slow until the root system is well established, increasing rapidly subsequently. Tuber begin to form on the rhizomes and roots about mid-summer. Although plants do not always flower in their first year, flowering usually commences in October and continues until February or march and in some situations, continues to May or June. Fruit may be present on plants all the year. In established plants, new growth forms on the rhizomes and tubers in spring increasing the size of the effected area. (Parsons and Cuthbertson 1992). Asparagus densiflorus can be found on, \"Dry to moist forests and openings. In Australia it has invaded coastal, littoral rainforest, rainforest, frontal dunes and sclerophyll forest and coastal heath (PIER, 2005). The Australian Weeds Committee (2004) states that, \"A. densiflorus is a persistent weed of urban bushland. 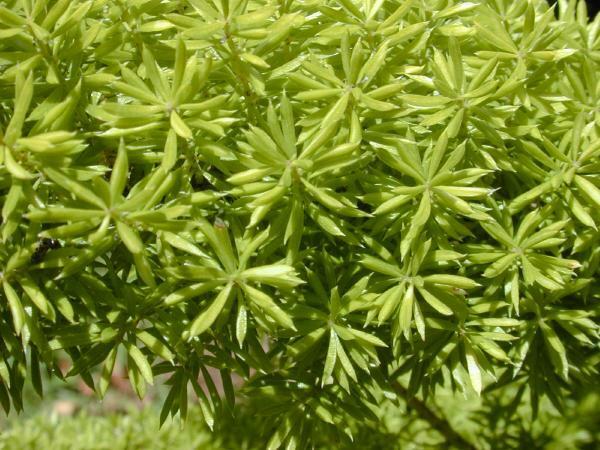 It is shade tolerant and grows best in shaded areas where other vegetation has been removed. It is also often found growing near abandoned houses or near habitation where pieces have been dumped.\" Jamieson (2002) states that, \"A. densiflorus grows in most soils and is fairly drought tolerant, but does much better in soil which is rich in organic matter and is watered regularly.\"
Plants in the genus Asparagus such as A. setaceus and A. densiflorus are called ferns, but are not true ferns since they produce seeds and not spores.\" Csurhes and Edwards (1998) state that, \"The plant produces large numbers of fleshy, red berries which usually each contain a single seed. The fruit is probably dispersed by birds. Asparagus densiflorus plants have extensive root systems with fairly large tubers, which are used in nature to provide food during long periods of drought in summer (Jamieson, 2002). The widespread use of this plant in ornamental settings coupled with production of large numbers of fruit that are undoubtedly attractive to birds which will continue to contribute to the plants spread (Bishop Museum, 1999). Principal source: University of Florida, 2002. Liliaceae/Lily Family Asparagus densiflorus (Kunth) Jessop. Florida Exotic Pest Plant Council. Recommended citation: Global Invasive Species Database (2019) Species profile: Asparagus densiflorus. Downloaded from http://www.iucngisd.org/gisd/species.php?sc=837 on 21-04-2019. Asparagus densiflorus has the potential to be similar to climbing asparagus in its ability to smother forest understory to a height of 2.5 - 5 m; this species can also smother ground cover and prevent regeneration of canopy species (Bay of Plenty Regional Council, undated). Preventative measures: A Risk assessment of Asparagus densiflorus for the Pacific region was prepared by Pacific Island Ecosystems at Risk (PIER) using the Australian risk assessment system (Pheloung, 1995). The result is a score of 15 and a recommendation of: reject the plant for import (Australia) or species likely to be of high risk (Pacific). A Risk assessment of Asparagus densiflorus for Australia was prepared by Pacific Island Ecosystems at Risk (PIER) using the Australian risk assessment system (Pheloung, 1995). The result is a score of 3 and a recommendation of: the plant requires further evaluation. The Asparagus Weeds Best Practice Management Manual offer some best practice management advice on the management and control of Asparagus weeds. The first section of this manual contains practical information on how to develop a weed management plan and is aimed at land managers who may be embarking on a new project or tackling a weed incursion for the first time. The sections that follow consist of identification and management information for individual Asparagus weed species including Asparagus asparagoides, A. declinatus, A. scandens, A. aethiopicus (=A. densiflorus) and A. africanus. Informations on Asparagus densiflorus has been recorded for the following locations. Click on the name for additional informations. Bay of Plenty Regional Council. UNDATED. Asparagus densiflorus. Weed Control information for the Bay of Plenty. Breaden, R. C.; T. R. Armstrong and D. Hinchliffe, 2006. The chemical control of the environmental weed basket asparagus (Asparagus aethiopicus L. cv spregeri) in Queensland. Plant Protection Quarterly Vol 21(3) 2006. CRC for Australian Weed Management 2004. Introductory weed management manual. Australian Government. Department of Environment and Heritage. Csurhes and Edwards, 1998. Asparagus densiflorus. Potential Environmental Weeds in Australia: Queensland Department of Natural Resources. Gilman, E. F. 1999. Asparagus densiflorus Myers1. University of Florida Cooperative Extension Service Fact Sheet FPS-52. He, C., T. Hsiang, and D. J. Wolyn. 2001. Activation of defense responses to Fusarium infection in Asparagus densiflorus. European Journal of Plant Pathology. 2001; 107(5): 473-483. Regional Weeds Advisory Committee, 2004. 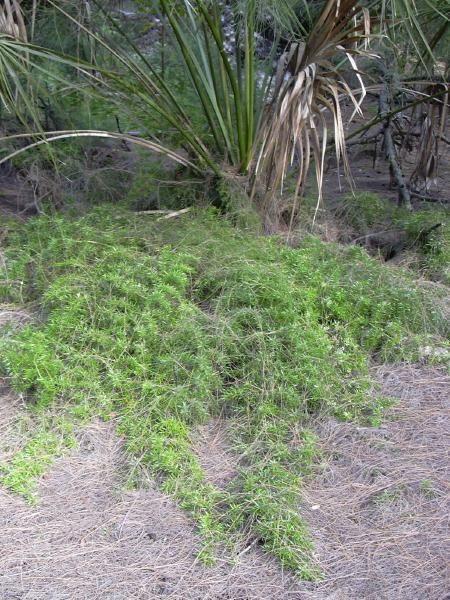 Draft Regional Weed Management Plan: Coastal Weeds. NSW North Coast Weeds Advisory Committee. Witt, A. B. R., and P. B. Edwards. 2001. Aspects of the Biology, Distribution, and Host Range of Crioceris sp. (Col.: Chrysomelidae: Criocerinae), a Potential Biological Control Agent for Asparagus asparagoides in Australia. Biological Control 23, 56-63 (2002). Australian Weeds Committee. 2004. Sprenger s Asparagus. National Weeds Strategy. Bahamas Environment Science & Technology Commission. UNDATED. The Bahamas Invasive Plant Species. Batianoff, G. N., and A. J. Franks. 1997. Invasion of sandy beachfronts by ornamental plant species in Queensland. Plant Protection Quarterly. 1997; 12(4): 180-186. Beaches and Dunes of Australia. UNDATED. Beaches and Dune Systems. Bishop Museum. 1999. Records of the Hawaii Biological Survey for 1998-Part 2: Notes 53. Bishop Museum Occasional Papers 59. Bishop Museum. 2000. Records of the Hawaii Biological Survey for 1999-Part 2: Notes 7. Bishop Museum Occasional Paper 64. Conover, C. A. 2003. Ferns. University of Florida IFAS Extension. Florence J., Chevillotte H., Ollier C. & Meyer J.-Y. 2007. Asparagus densiflorus Base de donn�es botaniques Nadeaud de l Herbier de la Polyn�sie fran�aise (PAP). ITIS (Integrated Taxonomic Information System). 2005. Online Database Asparagus densiflorus. Jamieson, H. G. 2002. Asparagus densiflorus. Kirstenbosch National Botanical Garden. PIER (Pacific Island Ecosystems at Risk). 2005. Asparagus densiflorus (Kunth) Jessop, Liliaceae. Russell, A. B. UNDATED. Asparagus densiflorus (Sprengeri group). Poisonous Plants of North Carolina. Singh, D. B., S. A. Nair, and T. V. R. S. Sharma. 1999. Asparagus densiflorus Sprengeri Robustus - An addition to the ornamental flora of Andamans. Journal of the Bombay Natural History Society. 1999; 96 (2): 356-359. University of Florida, 2002. Liliaceae/Lily Family Asparagus densiflorus (Kunth) Jessop. Florida Exotic Pest Plant Council. USDA-GRIN (Germplasm Resources Information Network). 2005. Asparagus densiflorus. National Genetic Resources Program [Online Database] National Germplasm Resources Laboratory, Beltsville, Maryland. USDA-NRCS (Natural Resource Conservation Service). 2005. Asparagus densiflorus. The PLANTS Database Version 3.5 [Online Database] National Plant Data Center, Baton Rouge, LA. Dennis Gannaway is the National Management Coordinator for Bridal Creeper (Asparagus asparagoides) in Australia. This is a Federal Government initiative to over see the implementation of the National Strategy for the management of Bridal Creeper and other invasive Asparagus weeds.